Atlantic Casino Club is a web based gaming platform which boasts its Atlantic City inspired site interface and game themes. It is owned and being operated by the Game Tech Group N.V. Casinos which established the site in 2015. Atlantic is currently licensed and registered under the government of Curacao. The site's license covers restrictions of several countries from accessing the platform. Players from the countries of the United States of America, Singapore, Turkey, and Israel are prohibited on playing games hosted by Atlantic Casino. This gaming platform is being managed by several software suppliers which have been providing Atlantic selections of games, exclusive site features, impressive promotions, and secured payment methods for the players. Some of these software providers include famous companies like Betsoft Gaming, NetEnt, Thunderkick, Gamescale, Microgaming, and 1x2 Gaming. Atlantic Casino's group of slot machine games is considered as the most diverse game collection on the site. Some of these games include popular game titles like Superman, Event Horizon, Merlin's Millions, Fashion Slot, Medusa II, and many more. These slots vary on different game themes and exceptional in-game bonuses and rewards. The site also features different card and table games which include famous titles like Blackjack, Roulette Pro, Pai Gow, Oasis Poker, Casino Hold 'Em, Blackjack Switch, and a lot more. These games are also offered on Atlantic's live gaming feature which has live dealers to cater the site's players. There are also video poker variants, action games and scratch cards offered on this site. 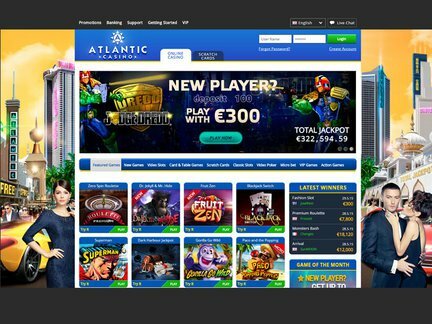 In terms of the site's offered promotions and bonuses, Atlantic treats its new players with a 250% welcome incentive amounting up to €2500. This reward is given upon the player's initial deposit on any of the site's offered games. Aside from this welcome reward, newcomers are also greeted with a €10 free bonus for choosing the site. Regular and loyal players of Atlantic are also treated with weekly and monthly promotions. These promotions usually have exciting freebies and cash rewards exclusively given to the site players. There is also a 15% payment method incentive given to players who deposit their wagers on selected payment methods of the site. Regulars also accumulate comp points which may be exchanged into cash rewards and other freebies. Atlantic's VIP program also works on a 4 tier system wherein the more wagers a player makes, the more VIP points or comp points the player gets. Overall, Atlantic Club Casino may be considered as a newcomer in the industry yet it has making its mark as one of the most credible and efficient gaming platforms in the market today. All in all, this review gives this gaming site a 5 out of 5 rating for living on the standards of being an excellent gaming platform today.